Oswego Health announces its popular MASH camp will be held August 7 and 8. One of the favorite hands-on tasks is learning how to suture. 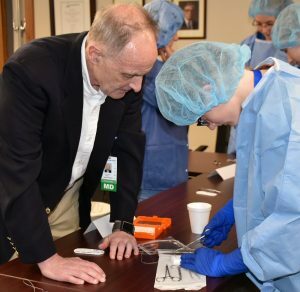 Helping a student learn the right technique is Oswego Health surgeon Howard Simon, MD. 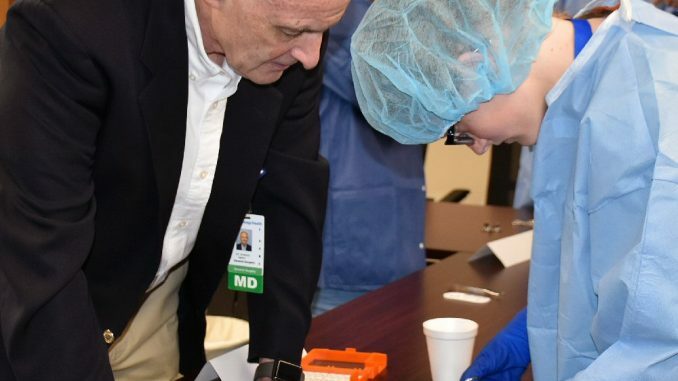 OSWEGO – Area students can learn more this summer about healthcare careers by taking part in many hands-on activities at Oswego Hospital’s MASH Camp. This year’s MASH Camp (Medical Academy of Science and Health) is open to students entering the eighth or ninth grades in the fall of 2019. It will be held at Oswego Hospital on August 7 and 8 from 8:30 a.m. to 4 p.m. both days. During the camp, students will have the opportunity to take part in hands-on activities, including learning how to suture, which is taught by the hospital surgery center staff. There will also be tours of many departments, providing the students with a behind-the-scenes look at the hospital and the variety of jobs that are offered in a healthcare setting. All campers will receive hospital scrubs to wear each day at camp, breakfast and lunch, a T-shirt, and educational materials. The camp is coordinated by the Central New York Area Health Education Center. Helping to support the MASH Camp is the Oswego Hospital Auxiliary. The deadline to apply for MASH Camp is June 30..
Community members with questions can call Dawn Smith, of Oswego Health MASH Camp coordinator, at 315-349-5566. Space is limited to 20 students at M.A.S.H. Camp and application will be determined by a selection process.